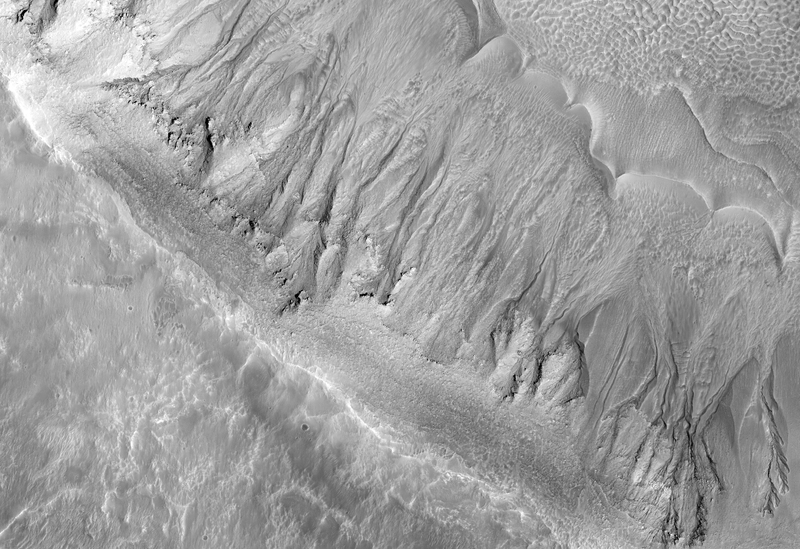 Gullies probably formed along the bouldery layers in the upper slopes of this unnamed crater within the last few million years. Gullies eroded these crater slopes and transported sediment downslope forming debris aprons multiple times. These older apron surfaces were cut by numerous fractures running perpendicular to the slope. Subsequent episodes of gully activity eroded through these fractures and deposited new aprons. 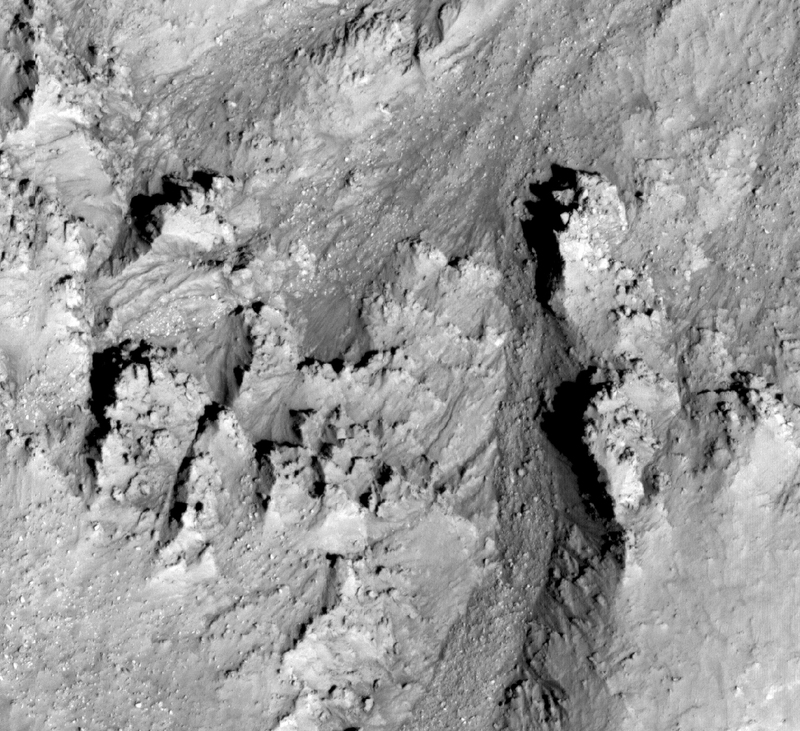 On the floor of the crater are ridges with bouldery layers. These ridges may mark the furthest extent of glaciers that predate much of the original gully activity. Bright flows continue to form in these gullies seasonally. In the upper gully regions, long shadows cast by jagged outcrops allow scientists to determine the heights and depths of landforms by measuring the length of the shadows cast by the ridges onto the gully floor. The map is projected here at a scale of 25 centimeters (9.8 inches) per pixel. [The original image scale is 25.2 centimeters (9.9 inches) per pixel (with 1 x 1 binning); objects on the order of 75 centimeters (29.5 inches) across are resolved.] North is up. Curiosity performs the first investigation of active sand dunes on another planet. Studying the Bagnold Dunes on Mars will help scientists understand the physics of Martian dunes and how they move. The north polar layered deposits, and the bright ice cap that covers them, are very young (by geologic standards) features. This image from NASA's Mars Reconnaissance Orbiter shows blocks of layered terrain within the Olympus Mons aureole. The aureole is a giant apron of chaotic material around the volcano. This image shows the quadrangle where NASA's Curiosity rover landed, now called Yellowknife. Researchers estimating the amount of carbon held in the ground at the largest known carbonate-containing deposit on Mars utilized data from three different NASA Mars orbiters. This map indicates geological units in the region of Mars around a smaller area where NASA's Mars Exploration Rover Opportunity has driven from early 2004 through late 2010. The Mars Color Imager test view looks northward and includes the large Argyre Basin in Mars' southern hemisphere. This global map of Mars was acquired on July 31, 2012, by the Mars Color Imager instrument on NASA's Mars Reconnaissance Orbiter. How before-and-after pictures led to the discovery of a fresh meteor impact crater on Mars.